When you want to print a sign from your favorite program, you want a digitally printed sign. Our flatbed printer does the trick. 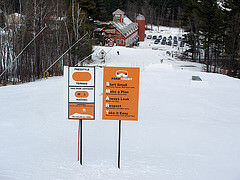 Here is recent work we did for Ragged Mountain Ski Area. Doing signs digitally means, first of all, that you can design them yourself. Then, they get produced quickly and affordably. They look great, they last, and you have all the colors of the rainbow available. Next time, try doing your signs this way. You’ll be glad you did! This entry was posted in Flatbed printing and tagged digital printing, fast signs, sign printing. Bookmark the permalink.